Hive is a data warehouse solution that has a thin SQL-like querying language called HiveQL. This language is used for querying data, and it saves you from writing native MapReduce processing to get your data out. Since you already know SQL, Hive is a good solution since it enables you to take advantage of your SQL knowledge to get data in and out of Apache Hadoop. One limitation of the Hive approach, though, is that it makes use of the append-only nature of HDFS to provide storage. This means that it is phenomenally easy to get the data in, but you cannot update it. 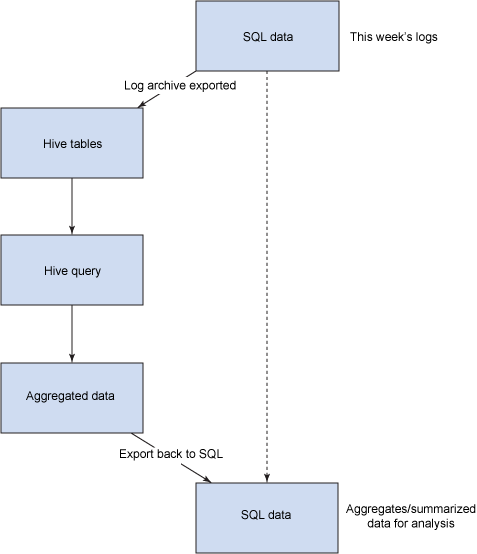 Hive is not a database but a data warehouse with convenient SQL querying built on top of it. Despite the convenient interface, particularly on very large datasets, the fact that the query time required to process requests is so large means that jobs are submitted and results accessed when available. This means that the information is not interactively available. HBase, by comparison, is a key-value (NoSQL) data store that enables you to write, update, and read data randomly, just like any other database. But it’s not SQL. HBase enables you to make use of Hadoop in a more traditional real-time fashion than would normally be possible with the Hadoop architecture. Processing and querying data is more complex with HBase, but you can combine the HBase structure with Hive to get an SQL-like interface. HBase can be really practical as part of a solution that adds the data, processes it, summarizes it through MapReduce, and stores the output for use in future processing. In short, think of Hive as an append-only SQL database and HBase as a more typical read-write NoSQL data store. Hive is useful for SQL integration if you want to store long-term data to be processed and summarized and loaded back. Hive’s major limitation is query speed. When dealing with billions of rows, there is no live querying of the data that would be fast enough for any interactive interface to the data. For example, with data logging, the quantities of data can be huge, but what you often need is quick, flexible querying on either summarized or extreme data (i.e., faults and failures). HBase can then be combined with traditional SQL or Hive to allow snapshots, ranges, or aggregate data to be queried. The primary reason to use Hive over a typical SQL database infrastructure is simply the size of the data and the length of time required to perform the query. Rather than dumping information into Hadoop, writing your own MapReduce query, and getting the information back out, with Hive you can (normally) write the same SQL statement, but on a much larger dataset. Hive accomplishes this task by translating the SQL statement into a more typical Hadoop MapReduce job that assembles the data into a tabular format. This is where the limitation comes, in that Hive is not a real-time, or live querying solution. Once you submit the job, it can take a long time to get a response. A typical use of Hive is to combine the real-time accessibility of data in a local SQL table, export that information into Hive long-term, and reimport the processed version that summarizes the data so it can be used in a live query environment, as seen in Figure 1. We can use the same SQL statement to get and obtain the data in both situations, a convenience that helps to harmonize and streamline your applications. The simplest way to get data in and out is by writing a custom application that will extract the required data from your existing SQL table and insert that data into Hive — that is, perform a select query and use INSERT to place those values directly into Hive. Alternatively, depending on your application type, you might consider inserting data directly into both your standard SQL and Hive stores. This way, you can check your standard SQL for recent queries and process Hive data on an hourly/daily/weekly schedule as required to produce the statistical data you require longer-term. More typically, you will be dumping entire tables or entire datasets by hour or day into Hive through an intermediary file. One benefit of this approach is that we easily introduce the file by running a local import or by copying that data directly into HDFS. Let’s look at this with an example, using the City of Chicago Traffic Tracker that studies bus data, giving a historical view of the speed of buses in different regions of Chicago at different times. A sample of the data is shown in Listing 1. The sample dataset is just over 2 million records, and it has been loaded from a CSV export. To get that information into Hive, we can export it to a CSV file. Then copy the data into HDFS: $ hdfs dfs -copyFromLocal chicago.csv. Now open Hive and create a suitable table. The second observation is that we are defining the table structure. There are binary structures within Hive, but using CSV natively is convenient for our purposes since we’ve exported the data to a CSV file. When loading the data, the CSV format specification here will be used to identify the fields in the data. The above example creates a standard table (the table within Hive’s data store within HDFS). You can also create an external table that uses the copied file directly. However, in an SQL-to-Hive environment, we want to make use of one big table into which we can append new data. Now the data can be loaded into the table: hive> load data inpath 'chicago.csv' into table chicago_bus;. This code adds the contents of the CSV file to the existing table. In this case, it is empty, but you can see how easy it would be to import additional data. Once the data is loaded, you can execute Hive queries from the Hive shell just as you would in any other SQL environment. For example, Listing 4 shows the same query to get the first 10 rows. The benefit comes when we perform an aggregate query. For example, let’s obtain an average bus speed for each region by day. As you can see from the output, the query is fundamentally the same as with MySQL (we are grouping by an alternative value), but Hive converts this into a MapReduce job, then calculates the summary values. The reality with data of this style is that the likelihood of requiring the speed in region 1, for example, at 9:50 last Thursday is quite low. But knowing the average speed per day for each region might help predict the timing of traffic or buses in the future. The summary data can be queried and analyzed efficiently with a few thousand rows in an SQL store to allow the data to be sliced and diced accordingly. To output that information back to a file, a number of options are available, but you can simply export back to a local file using the statement in Listing 6. This code creates a directory (chicagoout), into which the output is written as a series of text files. These can be loaded back into MySQL, but by default, the fields are separated by Ctrl+A. The output can be simplified to a CSV file again by creating a table beforehand, which uses the CSV formatting. Now rerun the job and insert the information into the table. You can now find the files that make up the table in your Hive datawarehouse directory, so you can copy them out for loading into your standard SQL store, for example, using LOAD DATA INFILE. This process sounds clunky, but it can be automated, and because we have files from each stage, it is easy to re-execute or reformat the information if required. If you are using Hive in the manner suggested earlier, and regularly processing and summarizing data daily, weekly or monthly, it might be simpler to create a view. Views within Hive are logical — that is, the output of the view gets re-created each time a query is executed. Although using views is more expensive, for a data exchange environment, views hugely simplify the process by simplifying the query structure and allowing consistent output as the underlying source tables expand with new data. For example, to create a view from our original speed/region summary, use Listing 10. Now we can perform Hive queries on the view including new selections. Not looking good for traffic in region 28, is it? Insert new data into a table — datalog, for example. When datalog is full (i.e., an hour, day, week, or month of information is complete), the table is renamed (to datalog_archive, for example), and a new table (same structure) is created. Data is exported from datalog_archive and appended into the Hive table for the data. Depending on how the data is used and processed, analysis occurs by accessing the live data or by running the exact same SQL query statement on Hive. If the data is needed quickly, a view or query is executed that imports the corresponding data back into an SQL table in a summarized format. For example, for systems logging data (RAM, disk, and other usages) of large clusters, the data is stored in SQL for a day. This approach allows for live monitoring and makes it possible to spot urgent trends. Data is written out each day to Hive where the log content is analyzed by a series of views that collect extreme values (for example, disk space less than 5 percent), as well as average disk usage. While reviewing the recent data, it’s easy to examine and correlate problems (extreme disk usage and increased CPU time, for example), and execute the same query on the Hive long-term store to get the detailed picture. Whereas Hive is useful for huge datasets where live queries are not required, HBase allows us to perform live queries on data, but it works differently. The primary difference is that HBase is not a tabular data store, so importing tabular data from an SQL store is more complex. That said, the flexible internal structure of HBase is also more flexible. Data sources of multiple different data structures can be merged together within HBase. For example, with log data, you can store multiple sensor data into a single table within HBase, a situation that would require multiple tables in an SQL store. Unlike Hive, which supports a native tabular layout for the source data, HBase stores key-value pairs. This key-value system complicates the process of exporting data and using it directly because it first needs to be identified and then formatted accordingly to be understood within HBase. Each item (or item identifier) requires a unique key. The unique ID is important because it is the only way to get individual data back again; the unique ID locates the record within the HBase table. Remember that HBase is about key-value pairs, and the unique ID (or key) is the identifier to the stored record data. For some data types, such as the log data in our Hive examples, the unique key is meaningless because we are unlikely to want to view just one record. For other types, the data may already have a suitable unique ID within the table you want to use. This dilemma can be solved by pre-processing our output, for example, and inserting a UUID() into our output. This code creates a new UUID for each row of output. The UUID can be used to identify each record — even though for this type of data, that identification is not individually useful. A secondary consideration within the export process is that HBase does not support joins. If you want to use HBase to write complex queries on your SQL data, you need to run a query within your SQL store that outputs an already-joined or aggregate record. Within HBase, tables are organized according to column families, and these can be used to bond multiple groups of individual columns, or you can use the column families as actual columns. The translation is from the table to the document structure, as shown in Figure 2. To import the data, you have to first create the table. HBase includes a basic shell for accepting commands. We can open it and create a table and a table group called cf. Copy the tab-separated file created earlier into HDFS: $ hdfs dfs -copyFromLocal chicago.tsv. Now we can run importtsv, a tool inside the HBase JAR that imports values from a tab-delimited file. 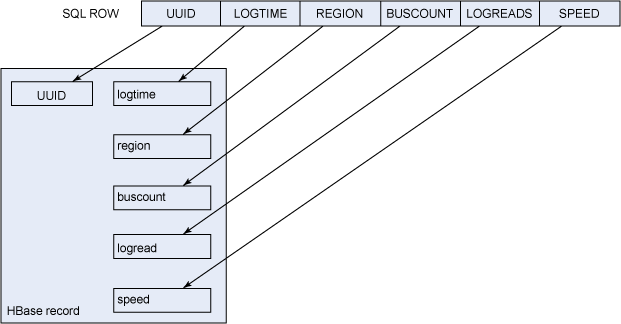 The content needs to be split to make it understandable: hadoop jar /usr/lib/hbase/hbase.jar importtsv. This code runs the importtsv tool, which is included as part of the HBase JAR: -Dimporttsv.columns=HBASE_ROW_KEY,logtime,region,buscount,readnumber,speed. The tool defines the columns that will be imported and how they will be identified. The fields are defined as a list; at least one of them must be the identifier (UUID) for each row, specified by HBASE_ROW_KEY, and the others define the field names (within the column family, cf) used for each input column. chicago— The table name. It must have been created before this tool is executed. chicago.tsv— The name of the file in HDFS to be imported. The output from this command (see Listing 15) is rather immense, but the import process is complicated. The data cannot be directly loaded. Instead, it gets parsed by a MapReduce process that extracts and then inserts the data into an HBase table. If you get a bad-lines output that shows a high number of errors, particularly if the number equals the number of rows you are importing, the problem is probably the format of the source file or the fact that the number of columns in the source file does not match the number of columns defined in the import specification. Once the data has been imported, we can use the shell to get one record to check that the import has worked. You can see the basic structure of the data as it exists within the HBase table. The unique ID identifies each record, then individual key-value pairs contain the detail (i.e., the columns from the original SQL table). An alternative model to the raw-data export (less common to HBase because of the record structure) is to use HBase to store summary values and parsed/composed queries. Because the data from HBase is stored in a readily and quickly accessible format (access the key and get the data), it can be used to access chunks of data that have been computed from other jobs, stored into HBase, and used to access the summary data. For example, the summary data we generated using Hive earlier in this example could have been written into HBase to be accessed quickly to provide statistical data on the fly for a website. Now that we have the data in HBase, we can start querying and reporting on the information. The primary advantage of HBase is its powerful querying facilities based on the MapReduce within Hadoop. Since the data is stored internally as simple key-value combinations, it is easy to process through MapReduce. MapReduce is no solution for someone from the SQL world, but we can take advantage of the flexible nature of Hive’s processing model to crunch HBase data using the HQL interface. You may remember earlier I described how Hive supports processing of mapped data types; this is what HBase data is: mapped key-value pairs. To use HBase data, we need to create a table within Hive that points to the HBase table and maps the key-value pairs in HBase to the column style of Hive. The first part of this code creates a table definition identical to the one we used natively in Hive, except that we have added the row-key UUID as the first column. The STORED BY block defines the storage format. The SERDEPROPERTIES block is the mapping between the document structure and the columns. The colon separates the key name and corresponding value and how the data should be mapped to the columns, in sequence, from the table definition. The TBLPROPERTIES block defines the name of the HBase table where the data lies. Once the table has been created, the table can be queried through Hive using native SQL, just as we saw earlier. Why use this method instead of a native import? The primary reason is the ease with which it can be queried (although no longer live), but also because the underlying HBase data can be updated, rather than just appended to. In an SQL-to-Hadoop architecture this advantage means we can take regular dumps of changing data from SQL and update the content. Given the information here, it’s worth reminding ourselves of the benefits of the two systems. Which one you use will depend entirely on your use case and the data you have available, and how you want to query it. Hive is great for massive processing of ever-increasing data. HBase is useful for querying data that may change over time and need to be updated. The primary reason for moving data between SQL stores and Hadoop is usually to take advantage of the massive storage and processing capabilities to process quantities of data larger than you could hope to cope with in SQL alone. How you exchange and process that information from your SQL store into Hadoop is, therefore, important. Large quantities of long-term data that need to be queried more interactively can take advantage of the append-only and SQL nature of Hive. For data that needs to be updated and processed, it might make more sense to use HBase. HBase also makes an ideal output target from Hive because it’s so easy to access summary data directly by using the native key-value store. When processing, you also need to consider how to get the data back in. With Hive, the process is easy because we can run SQL and get a table that can easily be imported back to our SQL store for straightforward or live query processing. In this article, I’ve covered a wide range of use cases and examples of how data can be exchanged more easily from SQL using tabular interfaces to the Hadoop and non-tabular storage underneath. Chicago Traffic Tracker Check out the Chicago Traffic Tracker. Big Data: Frequently Asked Questions for IBM InfoSphere BigInsights video Listen to Cindy Saracco discuss some of the frequently asked questions about IBM's Big Data platform and InfoSphere BigInsights. Big Data -- Analyzing Social Media for Watson Watch Cindy Saracco demonstrate portions of the scenario described in this article in Big Data -- Analyzing Social Media for Watson. IBM Watson Learn about the IBM Watson research project. Big Data University Check out Big Data University for free courses on Hadoop and big data. Apache Hadoop Learn more about Apache Hadoop. CDH4 Installation - Cloudera Support For information on installing Hadoop using CDH4, see CDH4 Installation - Cloudera Support. HadoopDB: An Architectural Hybrid of MapReduce and DBMS Technologies for Analytical Workloads Learn about the feasibility of building a hybrid system that takes the best features from both technologies. A Survey of Large Scale Data Management Approaches in Cloud Environments A comprehensive survey of numerous approaches and mechanisms of deploying data-intensive applications in the cloud, which are gaining a lot of momentum in both research and industrial communities. Apache.org Get Hadoop 0.20.1, Hadoop MapReduce, and Hadoop HDFS from Apache.org.